Santa Claus leads the parade of carolers south on Sterling Avenue on their way to Park Place for the menorah and Christmas tree lighting ceremony. Old English bulldog Rosy poses with Santa Claus in Park Place during Winterfest in Flossmoor. Rosy was there with her human, Tom Hamilton of Homewood. 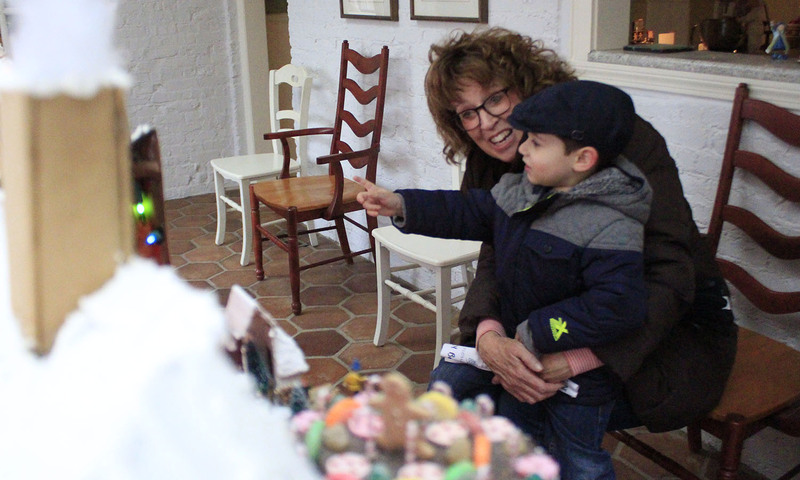 Janet Gustafson talks to a visitor about her locally famous gingerbread village. 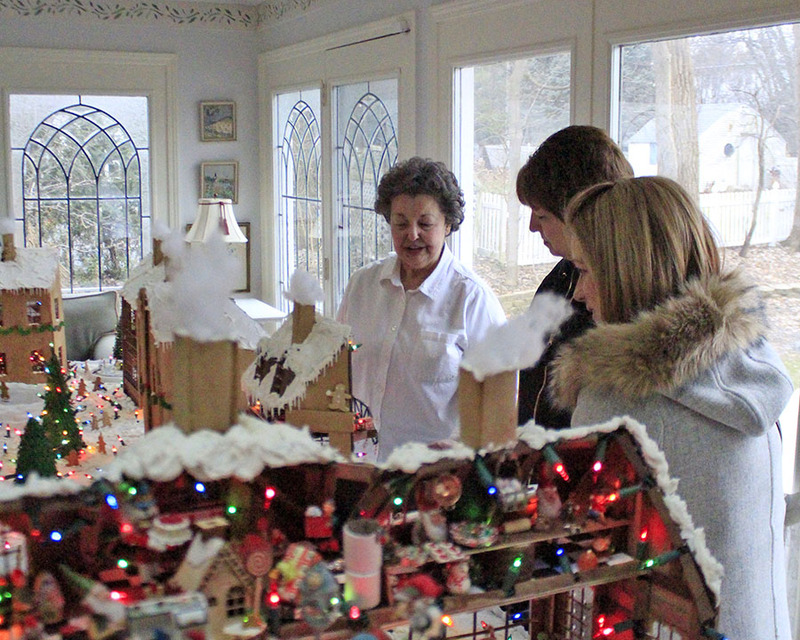 Jack Bollenbacher points at the Janet Gustafson's gingerbread scene, indicating a point of interest to his grandmother, Mary Ellen Bollenbacher. 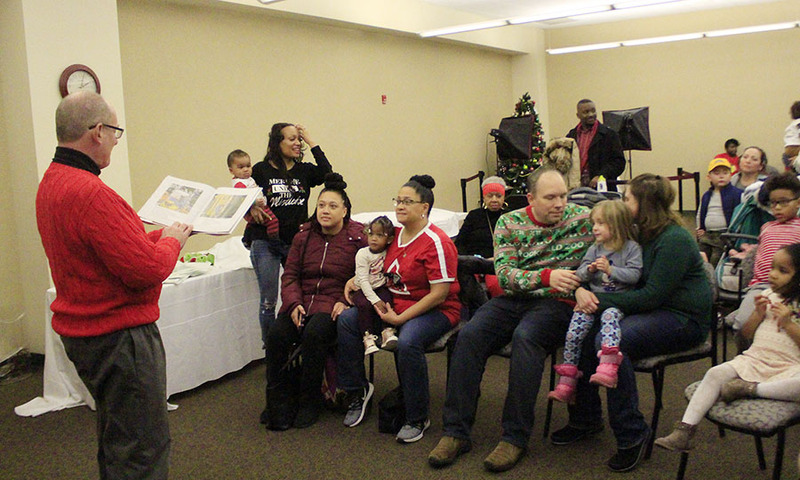 Flossmoor Mayor Paul Braun reads "How Santa Got His Job" by Stephen Krensky during Winterfest. 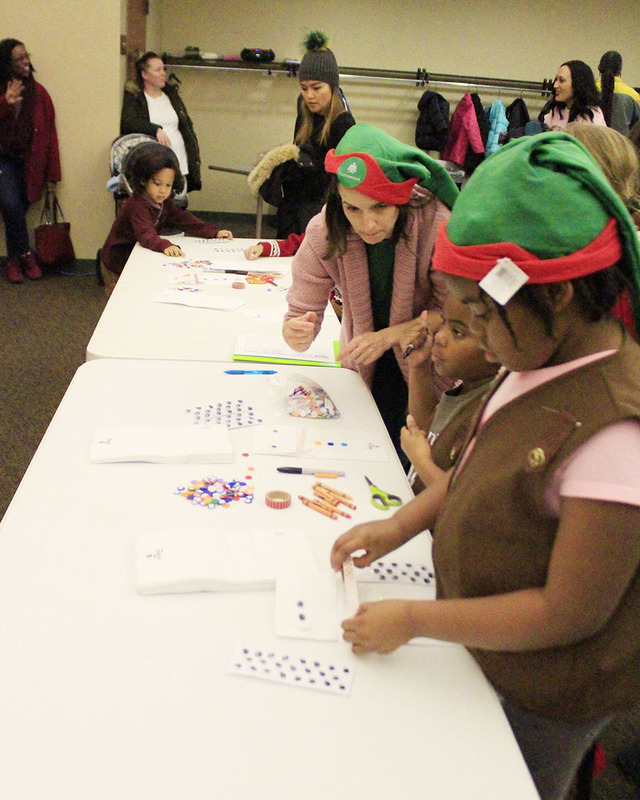 Girl Scouts make holiday crafts in the lower level of Flossmoor Public Library during Winterfest. Santa Claus arrives at Flossmoor Library to consult with youngsters about their Christmas wishes. 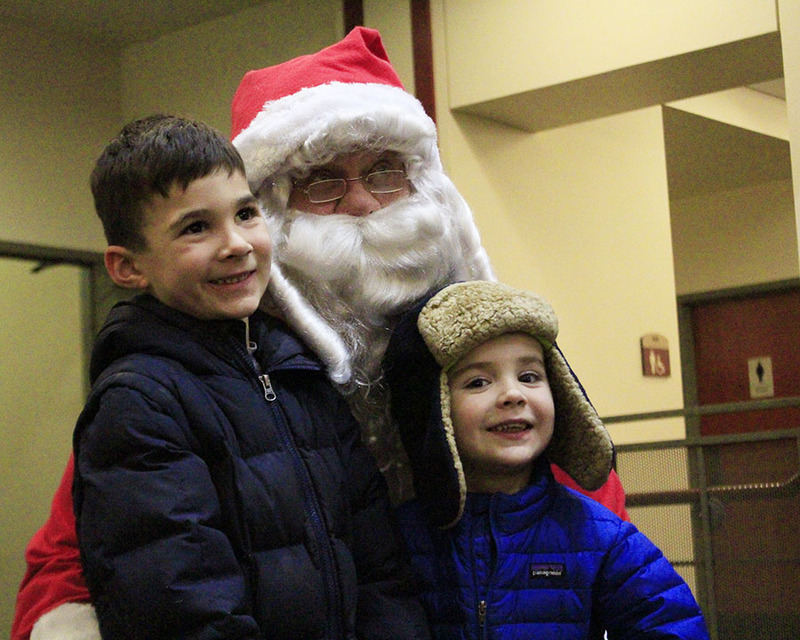 Conor, left, and Caleb Gochenour were the first children to greet Santa at Flossmoor Public Library. 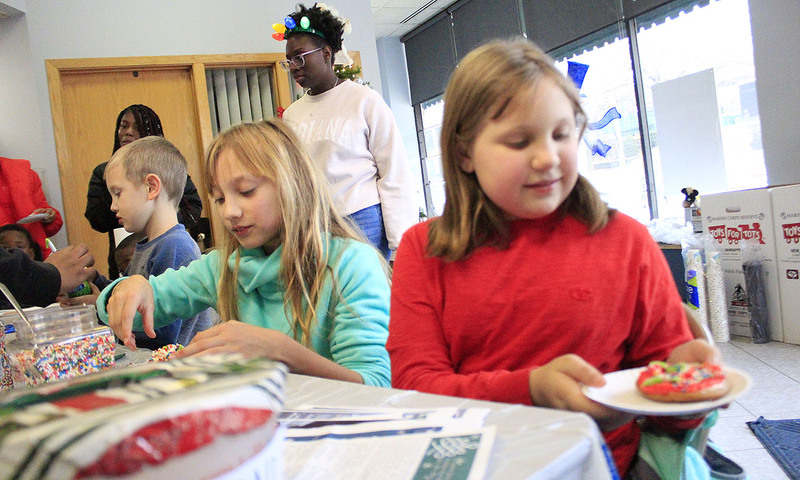 From left, Peter Buschmann, Emilia Buschmann and Freja Hill decorate cookies at Coldwell Banker in Flossmoor during Winterfest. 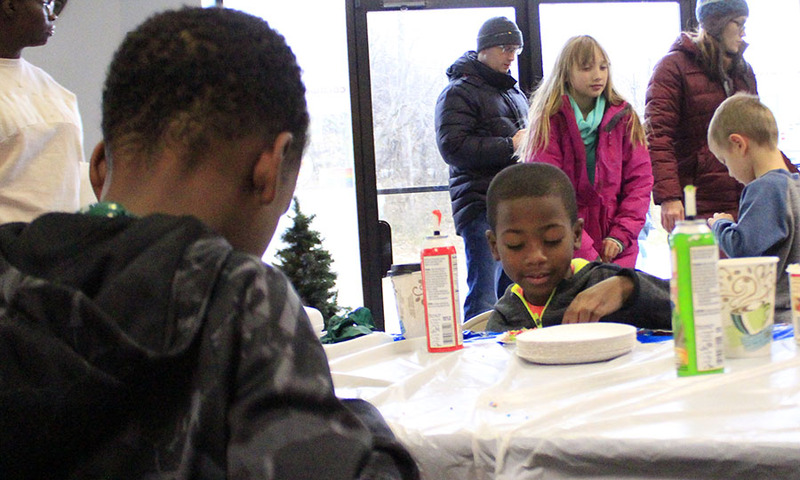 From left, Broderick and Braylon Booth work on their cookie decorations at Coldwell Banker during Winterfest. 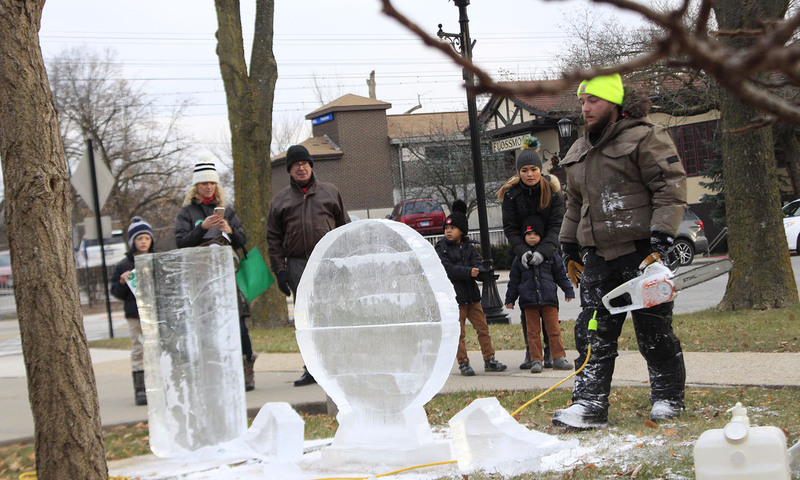 An ice sculptor works on two creations in front of Flossmoor Public Library. 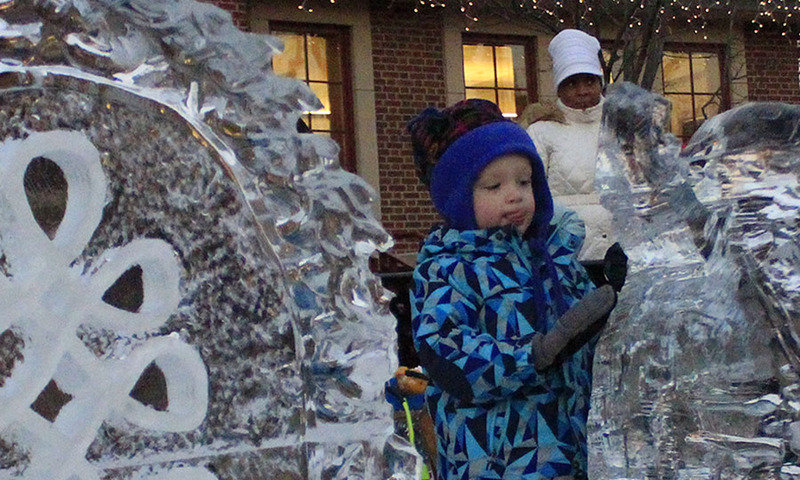 Miles Tanner, 2, poses for a photo with the Winterfest ice sculptures. 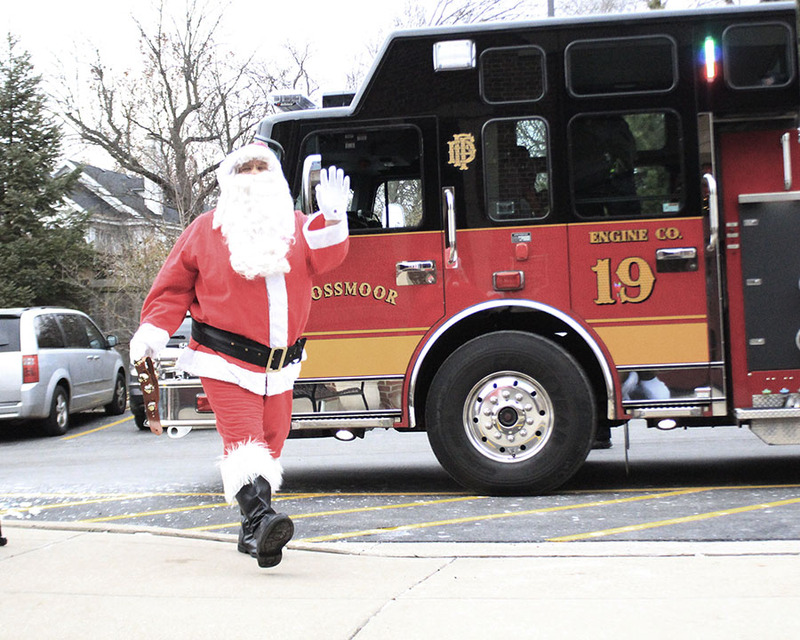 If the Santa who led the holiday parade during Flossmoor’s annual Winterfest Dec. 8 was not the “real Santa,” then he probably has connections to the real guy. At least, that’s 8-year-old Talia Thompson’s theory. Talia was one of dozens of children to snag photos with Santa at Flossmoor Public Library before he led a parade of merry residents to Flossmoor Park for a Christmas tree and menorah lighting ceremony. 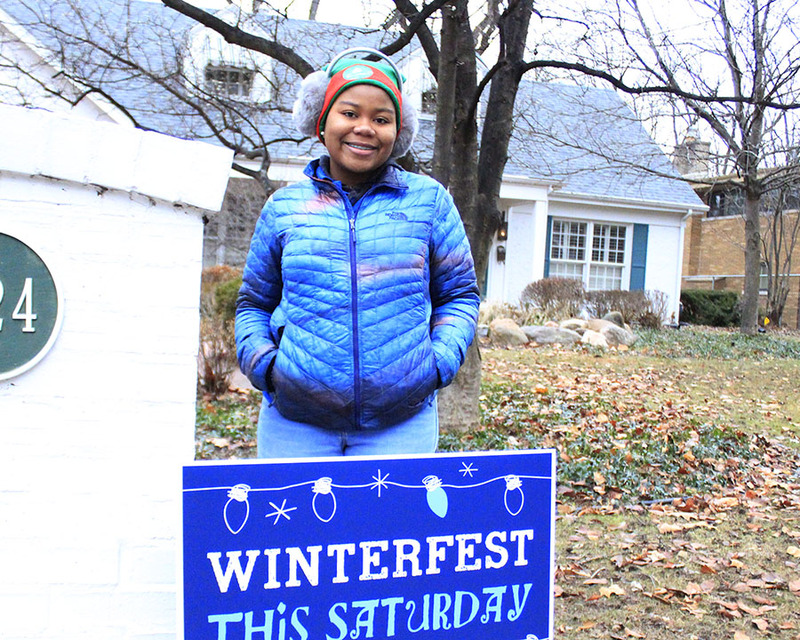 Winterfest seemed to have something for everyone, with activities ranging from Christmas storytime with Mayor Paul Braun to the start of the season’s business scavenger hunt and a tour of local “gingerbread lady” Janet Gustafson’s homemade sugary wonderland. Talia and her brother Isaiah Thompson, 11, gave Santa a gift of their own — a Mardi Gras beaded necklace. Isaiah, a Parker Junior High student, said that getting children in the holiday spirit was the true meaning of Santa’s visit. James Scott Jr. and Nicole Scott brought their children, 9-year-old James Scott III and 4-year-old Olivia Scott, to hear Christmas stories read by the mayor and take pictures with Santa. “It was definitely good for the kids with the reading section, which was great, by a celebrity around here,” James Scott Jr. said. Flossmoor firefighters were in the library as well handing out small toys to children, which Nicole Scott said is always a nice gesture. For Christina Carrillo, pictures with Santa included a special family member, Diego, a 2-year-old pit bull and Lab mix who donned a bright green and red sweater for the occasion. 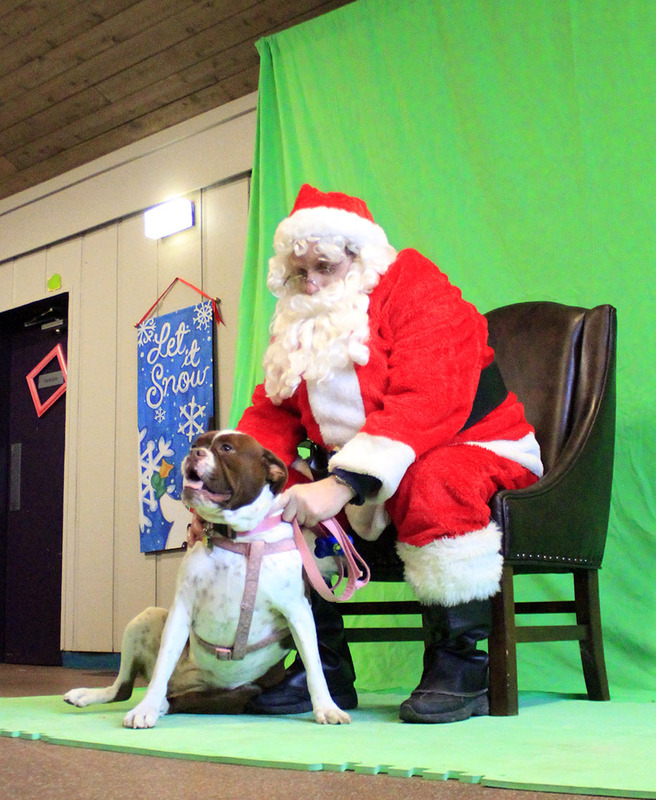 Santa posed for photos with local pets at Park Place earlier in the day, and Carrillo said her family wanted to celebrate Diego’s second Christmas since being adopted from the South Suburban Humane Society last October. Though Diego seemed a bit confused when he met Santa, he was no stranger to dressing up; he recently wore a crocodile costume on Halloween, Carrillo said. “As you can see, he is overly loved, so he gets dressed up for any occasion,” she said. 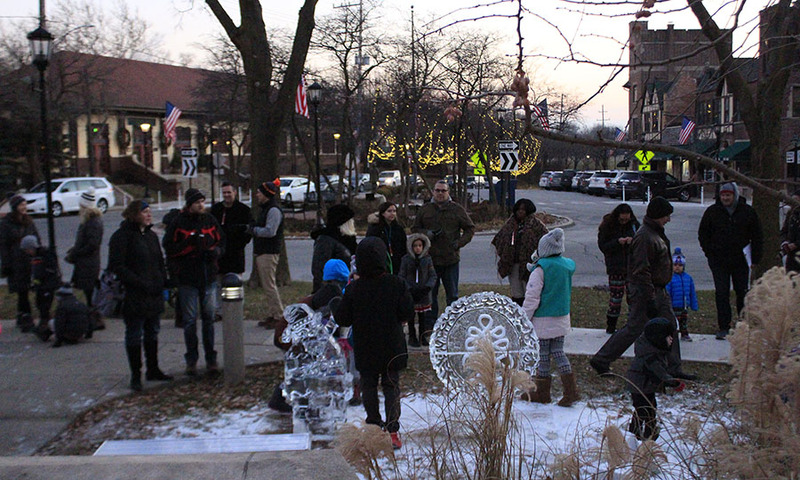 Meanwhile, the holiday scavenger hunt kicked off and brought residents into downtown businesses to locate hidden Village of Flossmoor logos for the chance to win a prize. Maureen Mader, owner of Dunning’s Market, said her restaurant gave candy canes and hot chocolate to customers participating in the scavenger hunt. Janet Gustafson has a similar outlook of community support and fellowship when it comes to allowing neighbors into her home to view her intricate display of gingerbread houses. Gustafson said she is now in her 70s and has been baking gingerbread since she was 21 when she read an article in Woman’s Day magazine. She begins baking and building each year around April so visitors can start coming by early November, she said. 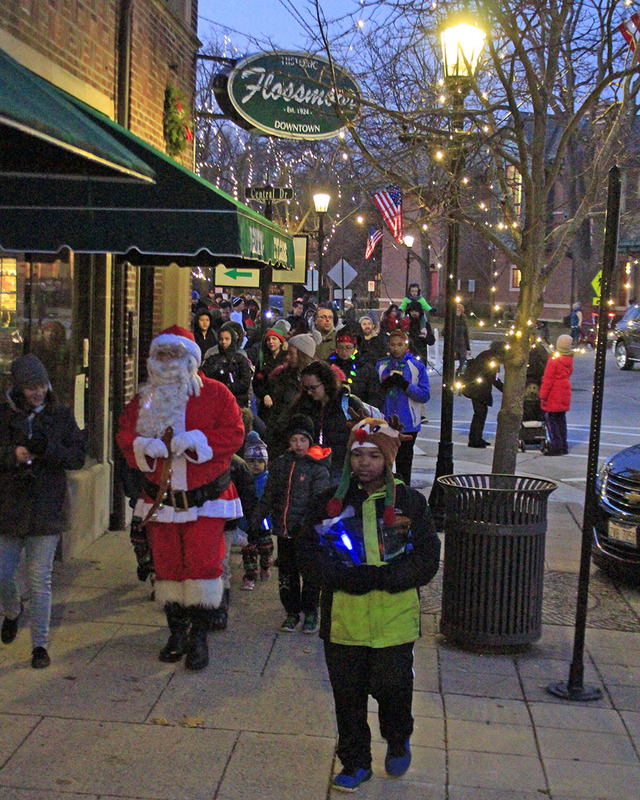 As Winterfest drew to a close, Santa led residents from the library toward Flossmoor Road, stopping to wave and offer a holiday greeting at shops along the way. His entourage sang Christmas carols along the parade route, and the songs continued after arriving at the towering Christmas tree and menorah in front of Park Place. Homewood-Flossmoor High School choir students lead the singing of "The Dreidel Song" in celebration of the seventh night of Hannukah while Mayor Paul Braun and Laura Brennan-Levy, Flossmoor’s program and event coordinator, lit all but one of the candles on the menorah. Then Braun offered thanks to everyone who made Winterfest a success. "On behalf of all of us, we wish you a happy, safe and healthy holiday season,” he said. Photos by Eric Crump/H-F Chronicle.